Winless for two years and fragile with the blade, the 41-year old Dubliner stood over his par saving effort on the picturesque but treacherous, par-three 16th in the final round of the PGA Grand Slam of Golf knowing that he’d just had to hole it. A turquoise blue sea lapped the cliffs to his right as he tried to ignore that fact that his wife had just been interviewed at greenside about his impending victory. Bad karma. Yes, he was three shots clear of Webb Simpson but there was still work to be done, a crucial putt to be holed before they reached the accessible, par-five 17th. 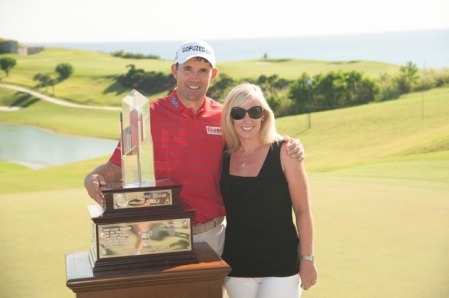 Padraig Harrington poses with his wife Caroline after his win. 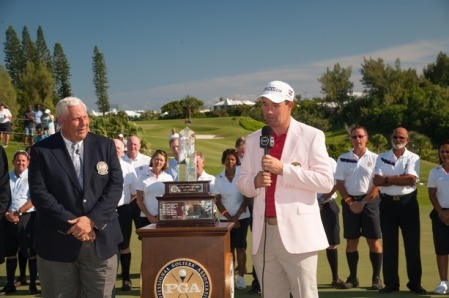 (Photo by Montana Pritchard/The PGA of America)As he confessed afterwards at the trophy presentation, he was tempted to walk over and stop the interview. 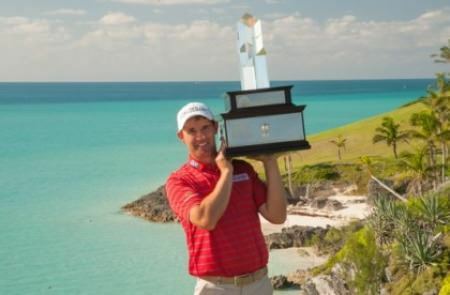 The putt dropped, of course, and Harrington went on to lift a trophy for the first time for just over two years, ending the second longest drought of his career. This year he has put the horrors of 2011 well and truly behind him and had it not been for the fact that his putter is still thawing out after 18 months in the deep freeze, he might have won the Masters or the US Open, or both. His putting inside three or four feet has made excruciating viewing for the past few years and he admits that there is still much work to be done in that area, things that he has to “tidy up” as he put it on Wednesday night. Spalsh Harri. 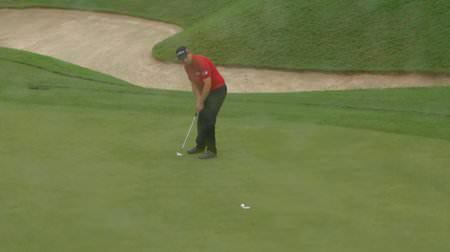 Harrington hits a bunker shot in the second round in Bermuda. 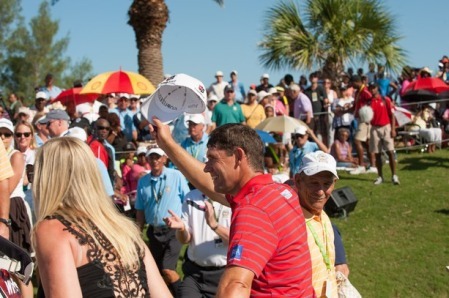 (Photo by Montana Pritchard/The PGA of America)Harrington fans are often maddened by his propensity for turning impending triumph into disaster but there is no sense in expecting the 41-year old to change that trait as he completes his 16th season as a professional. He will always put his neck on the block and take his chances. Confidence is everything in golf and Harrington confessed afterwards that winning the PGA Grand Slam - and holing that putt on the 16th - will do him nothing but good going forward. Fear and nerves have always been his friends and they were there for him this week. “I hit it left on the range and on every tee shot I was afraid of hitting it left and hit a lot of shots right,” he said afterwards. “But I really was happy about the fact that when I got into it, the old fight was there. (Photo by Montana Pritchard/The PGA of America)Ranked 57th in the world - he was as low as 96th before Augusta - he was too far away from the automatic places to warrant a Ryder Cup pick. Who could blame Jose Maria Olazabal for not picking a man who is ranked 185th out of 190 for putts holed between three and five feet this year? 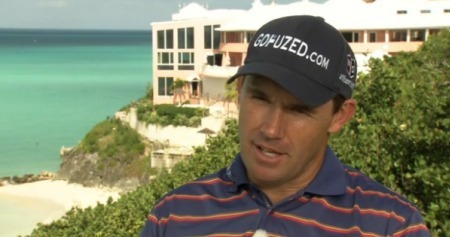 Yes, he missed a few in Bermuda but the overall picture is promising when it comes to any statistical analysis of Harrington’s game. He hits the ball further and straighter and finds more greens in regulation now than he did when he captured the third of his major wins in 2008. Padraig Harrington sporting the pink jacket awarded to the winner. 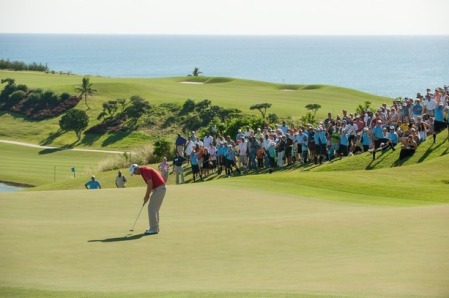 (Photo by Montana Pritchard/The PGA of America)Ranked first in the putts per round and one-putt percentage categories on the PGA Tour in 2008, he slipped to 24th and 55th respectively last year. Despite his problems on the short putts, he is back to ninth and 10th in those putting categories this season. When Harrington had that run of 22 second place finishes, it appeared that he was destined never to win again. But like buses, his the wins all came together, culminating in three major wins in 13 months. Stuck at the bus stop for the last few years, he hasn’t stopped changing. But this is nothing new. Putter permitting, there are compelling reasons to feel optimistic about Harrington as a major contender again. 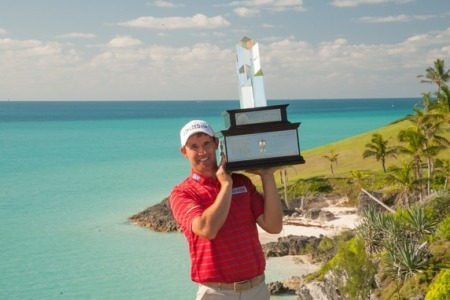 Winning breeds confidence and Harrington will be reinforced by his triumph in Bermuda. Having threatened and failed to win several times over the past year, he was pleased to get over the line this time. “It’s very important to win. There’s no doubt about it. And the feelings I would have out there are the exact same feelings you would have on a Sunday (in a regular event0 because I have a two‑shot lead and I’m trying to protect the lead somewhat. “I knew I need to make some birdies to move forward. It’s exactly like any Sunday. You know you don’t want to mess up and yet you still have to play some good golf. As for the future and his chances of adding to his haul of majors, he said: “I believe I’m playing really good golf. I believe that there’s good stuff in my game already, and I believe that there’s other stuff that I need to tidy up. “I see a lot of good things happening and I do believe that I’m turning the corner into a peak. What those peaks are, we’ll wait and see. “You know, you could have a beautiful 18 months and win half a dozen tournaments, but no major. Caroline Harrington watches the action in Bermuda. 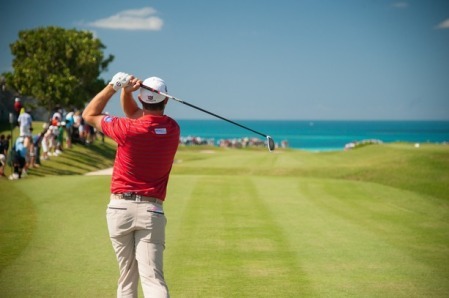 (Photo by Montana Pritchard/The PGA of America)“Maybe I could win one major and no other tournaments and that would probably be a better 18 months to be honest. You don’t know what’s going to happen in terms of winning and winning majors. They are not that easy to come by. “It was pretty tough for me after 2007 and by the end of 2008, it seemed quite easy. I do realise with experience that the wins, they don’t come around as often as you think. I do believe I’m going into a nice period in my career now, and I’m looking forward to some good successes. 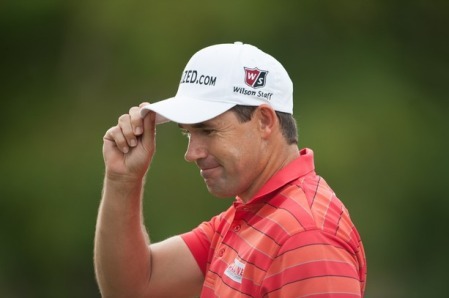 Padraig Harrington is not saying the best is yet to come. But he does see more peaks ahead. Padraig Harrington might be 41 but he’s not thinking about his age but racking up more majors before puts away his clubs for good. 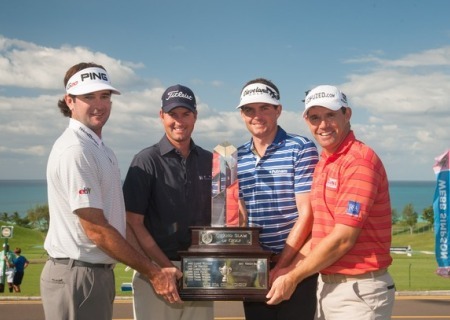 Padraig Harrington poses with the trophy after winning the 30th Grand Slam of Golf in Bermuda. 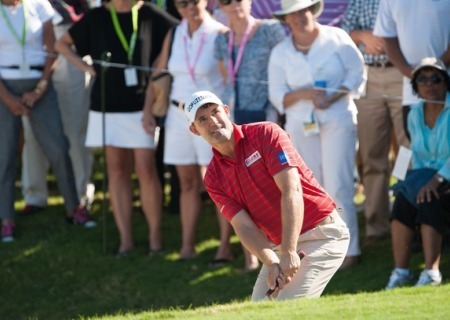 (Photo courtesy Montana Pritchard/The PGA of America)Pádraig Harrington hopes he’s got the winning habit again after closing with the sweetest three-putt of his career to win the PGA Grand Slam of Golf in Bermuda and end his two-year victory drought.